Why Is This Country Dancing? I despise guest books. You know, those large bound volumes, sometimes flowery, often unlined and large as artists’ sketchbooks, where travelers are invited to leave their salient remarks and summations of stays in hotels, b and b’s, or vacation rentals. Recently, my wife, daughter and I rented a charming one room cottage – appropriately, if not very romantically, dubbed the “Casa do Tanque – set amidst a glowing field of purple and yellow wildflowers down a peaceful ravine near mangrove fields along the lovely rolling topography of Portugal’s Alentejo coast. In three days there, we all got properly relaxed, doing as little as possible except hunt for various strange bugs and butterflies (in my eight-year-old’s case), read in hammocks, go for short hikes, have picnics, outdoor showers and barbeques each night. First, we hustled our increasingly agitated daughter into the car parked amidst the wildflowers – at least, the Peugeot was unlocked. From inside, we could soon hear her screaming for fear of the dogs.Our evening had gone from total relaxation to utter hysteria in seconds. What to do? Windows to the cottage were too high to reach, but there was one set of glass doors. Our last resort, reached with remarkable haste, was to smash open several of the lower panes to reach the inner lock. However, the glass wouldn’t give easily. Not until my wife and I were utterly soaked. At last, we found a rock large and jagged enough to do the job in ten smashes. Then the old door bolt wouldn’t give, but did at last. With dogs, if not dinner, rescued and disaster averted, the event quickly turned into one of those great tales of battle and badges of honor for travelers everywhere. We had made ourselves a vivid memory of our sojourn in paradise better than any trinkets or knit coasters we could pick up. Guilty as I felt about initiating the whole degrading chain of events, I had pretty much put the whole business out of mind until we checked out several days later – and, in cleaning up and replacing the TV remotes where they belonged, found one of those darn guest registers on the carpeted floor. Why did I always feel compelled to open these penned Pandora’s boxes? Inside, on page after page, accompanied by quaint drawings of daisies and doilies, scrawled in six languages and eight colors of ballpoint, were dozens of tributes to the marvelous cottage, its magnificent nearby attractions, the wonderful peace, serenity and wind-surfing so many far-more knowing pilgrims had found before us. Why didn’t anyone ever have anything bad to say, any complaints whatsoever, any mishaps or near-conflagrations like ours to memorialize? Was this the travel equivalent of Freud’s repression of the unconscious, with all traumas born of being strangers papered over with prose that could only be described, even without accompanying soundtrack, as “breathless”? How was it all the amateur Fodors who ever came before me always managed to have such an absolutely unblemished and blissful time, always knew their way straight to the best waves, most charming villages and personal moments of transformation? Could it be me and mine were the only ones who ever got locked out of Nirvana, stumbled or got cut with thorns on the path to redemptive restoration? I wanted to scrawl down the entire account of our near-fire incident, but of course, I was at that moment too much in a hurry to get back to the city, also too lazy and relaxed by the past few days to even attempt it. Besides, even a grump like me felt ashamed to smudge the cavalcade of pure praise on these thick and indestructible pages. Nothing, no guides or magazines or classic travelogues, have ever made me feel so much like I’d missed the boat of good times and ready discoveries than these instant encyclopedia of joy. No more guest registers for me, please. To flip these pages is to peer into my restless soul and all it lacked, all the sights my restless eye and all the reveries my avid heart always skipped past. “The farther one travels, the less one really knows . . . “ Beatle George Harrison once intoned, in a perfect distillation of Eastern wisdom. Today, this seems more true than ever — more than he or any of the sages of immobility could have envisioned – and not just from some transcendental point of view. On the one hand, we are more enabled to experience many of travel’s more salutary aspects from our desktop; on the other, the experiences or immersions we seek out through traveling are less and less in evidence. This has led to me to start daydreaming about creating virtual tours to “mental landscapes.” By this, I mean that the worlds all of us imagine when listening to say, Indian classical music, or reading a novel set in the Australian outback, are at this point far more exotic, strange and startling than anything we’d encounter in actual places. The India that echoes in the beat of the tabla or the drone of the tamboura is eternal, ethereal, contemplative, evocative of glinting jewels, happy gods, mad gurus, mysterious princesses. When we land in the real India of the 21st century, we immediately have our sniffing tourist noses rubbed in such disillusioning aspects as Indian gas stations, Indian highways and, as of recent developments, Indian shopping malls. Substitute any country you like. When I interviewed master travel writer Paul Theroux awhile back on a visit to Bangkok, and asked him where he thinks the “exotic” now lies, he did make the salient point that it’s the consciousness of the people in a 7-11 convenience store in Thailand (found on every corner) that matter more than the 7-11 and all its shelves of Lay’s potato chips. In other words, maybe the kid chugging a Coke next to you still believes in burning incense before graven images. But the author also admitted that real travel, as asserted in a film made by one of his sons, might lie at this stage of history only in dangerous war zones. It’s easy to make fun of the “bad mood” school of travel writing that I unwittingly joined (and Theroux did much to found). Yet perhaps it was about more than a personal predilection toward kvetching and disappointment; perhaps it was even prophetic. “I can know myself only through disaster,” I once wrote. Is not the opportunity for the disastrous, and all the self-learning that can bring, the only thing left that we can’t get from scrolling Trip Advisor? (The triple-negative seems appropriate.) Maybe we really can travel farther through cultural telepathy and by bringing the distilled essence of distant places home through intellectual adventuring. The other night I was taken to La Siesta, billed as the only Mexican restaurant in Lisbon. (That’s Lisbon, Portugal – the original, folks, and not the Lisbons of Ohio or South Dakota that come up, to hilarious effect, whenever I Google to find a bookshop.) It seemed a welcome change from the usual local far of salted codfish variants, potatoes and soggy greens. Everything gets old after awhile, even the freshest fish known to man. So I wasn’t surprised by the runny guacamole, more soup than dip, that was obviously store-bought, the tacos in flower-shaped pastry cups, a puree of black beans too blended to taste refried (all at insanely unjustified prices). When I asked for spicier salsa, the waiters, mostly Africans from Portugal’s former colonies, had no idea how to respond. La Siesta did provide a house mariachi band, though with only two members. Upon my testing, their limited repertoire did not extend to Mexican standards like “Guadalajara.” Then again, we diners were far from Guadalajara, perhaps with good reason. For the millions of faux replicas of different cuisines world-wide, this one ranked decided in the middle. I tried not to calculate how many such disappointing outposts I had visited in my life. (The Swiss yodelers of Seoul, Korea was one travel writing colleague’s fave.) But what did surprise me here, as in many others, was how full the tables were, and how much the unaware and uninitiated seemed to be enjoying their candlelit dates with canned dreariness. Perhaps they really didn’t know any better (though in an age of migration, jet travel and Internet recipes, this seemed unlikely). More likely, my superfluous demand for authenticity is simply as overrated as it is underappreciated. If you take the actions of humanity as polling results, then the vast majority of us would really rather have our meals, experiences and cultures watered down, boiled down, dumbed down, mediated, packaged for easy access, plated for simple digestibility. Never mind the insistence of hipsters and “new age” travelers that something, maybe everything, is lost each time we give in to the shortcut, the guided tour, the purposely bland. Authenticity, it turns out, is a bit too bony, gritty, hot and threatening for most of us. Real is what we say we need, fake is what we crave. “My friend!” No other two words in this world are more terrifying. For the traveler, any such greeting, especially from an affable stranger with loping gait and purposely casual affect, is pretty certain to lead to something other than friendship. Over more decades than I care to count as both an amateur and professional wanderer, I have never had such an encounter, usually started on some crowded street corner, that ended well. My instantaneous “friends” in China wanted me to buy them cigarettes and blue jeans at the appropriately named Friendship Stores – state-run importers that took only the soon-to-be phased-out “F.E.C.” (not Friendly, but Foreign Exchange Currency). In Vietnam, a sweet girl I met in a Saigon park invited me to a family dinner where her father handed me a photo of her with English scrawl on the back saying, “Please adopt my daughter!” She told me that she loved music and I promised to send her a small electric keyboard — but as I was preparing to do so back in the U.S., I got a letter asking for ten thousand dollars to help fund an older sister’s college education! Friends in most other places wanted, of course, to change money (a practice I foreswore after an amazing sleight of hand in a Delhi back alley, in which a wad of black-market bills somehow vanished between the time my eyes saw them and my hand grasped them); or to bring me to their family showroom for precious items I didn’t want or need. Turkey would get a rise since even now, the place is as little-known to Americans as it is overrun with Europeans. But the place seemed to me a fail-safe option, sure to please because it offered a little bit of everything: superb food at a pittance and accessible through points at the nearest simmering pots, magnificent landscapes, Mediterranean weather, luscious sea coasts, numerous layers of history, art and oddities, all mingled in an especially charming state of ruin, the exoticism of Islam in its most non-threatening form, not to mention back alleys teeming with boys bearing silver trays laden with cups of mint tea. The country has always won a sure place in my top ten “favorites” – stay tuned for such a list, and its criteria, coming soon – in spite of the fact that seemingly half the adult male population was employed in trying to sell me a carpet. How naïve I was once time in the southern port of Antalya when some mustachioed Kemal invited me out of the blue to share a wonderful supper, punctuated by numerous toasts of mind-numbing raki! How could I have believed that I was really the first American he had ever seen in the flesh and that his interest in the Democrat and Grand Ol’ parties was as passionate as presented? Of course, the meal ended with discussion of the ancient local art of weaving, and my new pals exclusive connections to the very best sources for appreciating said art. The most amazing aspect of such salesmen’s technique is that they seem willing to wait through many meals and toasts, through numerous solicitations, through hours of guidance and as many cups of tea as it takes and as much time flipping through their entire inventory to coax someone into pulling out their money (often to get rid of the nuisance rather than obtain their goods, which always carry the catch of being too cumbersome to carry or bothersome to ship). I still have a few flimsy area rugs, killer kilims in my closet to testify to my lack of staying power – somehow they never look as geometrically pleasing or exceptionally unique as they did at the time of purchase. Does travel really foster international understanding, tolerance and brotherhood? Or does it only make the harsh realities of a hustling world that much sharper? And set most of us even more firmly in our suspicions, fears, narrowness? Sorry, but the jury is still out on that one – and the world will never quite be convinced otherwise despite a barrage of advertising campaigns by the Tourism Boards of Yemen, Bulgaria or Malaysia (my former home and another personal favorite, but chock-a-block with malls, highways and ethnic tensions, and decidedly not the realm of dancing girls and empty sands depicted). True friendship, it turns out, is not one of those items included free of charge on the next package tour. “Very old, very beautiful . . . “ That’s been the mantra and constant joke since a trip to Paris as a poor student when a comrade and I sat on a city bus behind the quintessential elderly tourist couple from Middle America who reacted to every site along the route, monuments and apartment blocks alike, with hubby muttering “Very old,” and wifey echoing in confirmation, “Very beautiful.” Four words that pretty much summarize the European experience for most first-timers. But I am no first-timer in Paris anymore. I have duly found friends to crash with – avoiding the cost and indignity of those cheap hotel walk-ups where the toilet paper was always yesterday’s newspaper torn into careful squares. I now treat the place much like any parent of an eight-year-old, eschewing the latest art exhibits or Left Bank bookshops for un-Celine-like journeys to the end of the Metro line in search of places like the heartless, mammoth and stylishly bulky in the French manner city of science, housing within a “Cite des Enfants” which, much to my daughter’s disappointment, is all sold out on Easter Sunday. The Pompidou Centre’s gallery for kids is empty when I check, but the bookstore, one of the world’s finest, offers more than enough amusement and browsing through a selection of games, puzzles, activity books and stickers that aspire to turn any vapid tyke into the next Monet, Manet or similar. This time, I have only a single frigid afternoon to wander freely along the Seine or down the back byways of Le Marais, increasingly another designer outlet mixed with falafel and deli outlets that are places of pilgrimages for co-religionists seeking evidence of French-Jewish life (though the corned beef and cheesecake are among the few items that the local gourmet touch seems to have left unimproved). I don’t really do much: discovering a special bakery window full of home-style plum cakes, taking a chance on small art gallery viewings, or simply allowing myself to get lost and go agog once more at the City of Light’s enduring, bone-white blocks of oldness and beautifulness. And I let the high quality of jazzy buskers in the underground tunnels of the Bastille stop impress me as much as the Mona Lisa. Yet I am once more put back into what for me is the finest state of travel. Suddenly, a strange excitement clutches at my chest and I feel myself communing with the spirits of the millions of restless, solitary wanderers who have come before me. To me, the best part of traveling isn’t the opportunity to meet and forge mutual understanding with millions of strangers. No, the great gift is to be allowed to have an excuse be alone, even deeply lonely and estranged, in fact to revel in it. Bereft of map or language or purpose or context, to simply amble along streets one has never walked down and never will again, allowing an unapologetic curiosity at new things to mingle with the very old notion of one’s solitary place in the universal, even of circling toward fate. The French have certainly grown much friendlier, less stuffy, since olden days when they turned up their noses at my attempts to buy just half a loaf of bread (and survived, with my friend, on honey-soaked Tunisian doughnuts instead). Now they all wish “Bonne Journee!” like automatons, void of sincerity in the same way American fast-food greeters spew out, “Have a Nice Day!” But Paris, for me, affords the chance to take stock of the lifetime in between youth and age and to find the link that is always there – the person who is forever happy, perhaps at my most bittersweet happiest, to mingle with humanity while bereft of language or status, simply privileged to look upon the spectacle, and better yet, unequipped to join in, at once accepting the world as it and glorying in this momentary refusal. Spain’s capital has always struck me as the least vibrant of e-Spanish spaces. Maybe the heavily overlay of vaguely Arabized government and army headquarters has done much to squelch and dampen all the frenetic fandangos and trill-like electricity of speedy speech that the country is known for. On a recent visit back to visit my cousin and her long-time mate, two honorary gypsies who, like surprisingly many others, have found their life-time satisfaction in adopting the lifestyle that goes by the name of the art form called flamenco, she an earthy dancer with non-Americanized handle, he a renowned guitarist whose hard-drinking and hard-strumming was never any sort of pose, living in a fourth-floor walk-up festooned in tiled plates and Arabic carpets that would go far to define the term “funky” in décor without even trying. All around on the streets is the persistent hard-edged grubbiness of Spanish life they seem to thrive in, with the usual packs of drunks, drug addicts, Gitano barkers and beggars, further amplified by Europe’s downward trending economics. 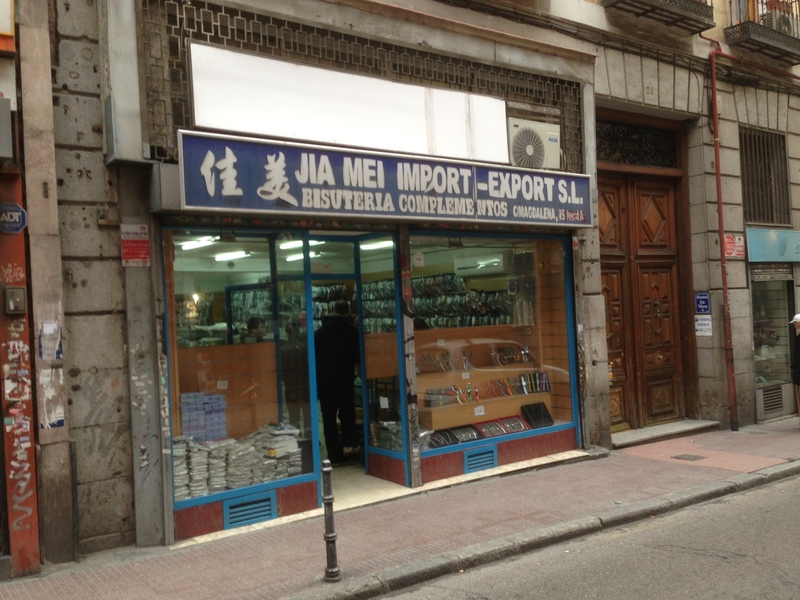 But what surprises and amazes this time is how much of the entire historic core of the city around the Plaza Tirso de Molina – upon which I look from a flowered hostal balcony readily had at only 40 euros or so – is entirely claimed and rented out by shop front after shop front of migrant Chinese. Not only that, not merely all the art deco bombast of the past replaced by Chinese calligraphy inscrutable to nearly all but themselves, but nearly all of these identical businesses are doing a bulk trade in the cheapest and cheesiest of scarves, jewelry, blouses, etc. – and sit empty all day, with two or three uncouth Cantonese clerks sleeping at their stations. How exactly did these blocks after blocks of illegal and irrelevant establishments allowed to come into existence? With what official looks to the side? And what purpose do they serve exactly, except as obvious fronts for more sinister purposes of money-laundering, people-enslaving and such? More importantly, to travelers like me anyhow, what will become of the tiny bars and bakeries and bocadillo shops that formed the web of life that went by the name of Madrid? Are we about to designate spots on a map – the Google map, one presumes – as “places formerly known as…” The disappearance of place, of locus, of individual locality, is no different from the extinction of a species. Whither the Madrid fought over and balladized over in the Spanish Civil War? These unwholesome wholesalers know nothing of that and make for a sanitizing occupier far more efficient than all the battalion of Franco, who were, after all, at least Spanish in their casual brutality. Still, I don’t think they are ever going to take anyone on guided tours of cheap Chinese groceries. And even if the Sino-ization of the planet reaches the all-encompassing levels of former American-ization, will they leave an imprint that is anything more than replicating their bad taste, their ignorance, their unadorned attempts at mere cash register survival? Maybe it’s only shades of mix-up, levels of cultural dilution, that count or ought to be taken account of now. Or am I simply over-reacting as an old-fashioned old-timer who wants my destinations straight as most of us once used to take our whiskey? CHAD: Everything in life, looked at properly, is a destination. That first unpaid journey down the fallopian tubes and out of the womb is only one of many faced without maps or guidebooks, no trip advisor warnings or hot tips to smooth the shocks or pave the blood-strewn way. Families, neighborhoods, schools – all are landing points on a package tour none of us actually sign up for. We never even get to see the brochures, the itineraries, the promises of romance and revelation all involved know are false. At the risk of getting utterly banal, all of us are travelers. Or are we mere tourists, stealing snapshots as we move through our personal history’s pre-ordained scenic viewpoints? Not that I claim any special aptitude as an adventurer or even a backpacker, bad packer, on my own meandering expedition. I certainly never aspired to be a travel writer and never took a course or got a degree, advanced or otherwise, in this doggedly amateur profession. In truth, no person could be less qualified or possess less natural aptitude for such a vocation. Every aspect of the process fills me with dread. The night before a trip, I am up all night in a state of apprehension, anticipating nothing but the anti-thrilling. I can’t stand saying goodbye to cozily familiar set of walls, to own bed and kitchen, the annoyances of living out of a suitcases, with seemingly instant losses in scissors and socks, the terror of airports, the turbulence rocking a tin can high off the ground, and worse still, the sight of those mediocrities of fellow beings one might have to face mass death with. Still worse, on arrival, the traveler is forever that rare sort of human who has purposely put himself or herself at a disadvantage, in a continual state of being one step behind, out of touch and short on basic information, befuddled and benighted, the ultimate outsider but without any of the nobility that’s supposed to come with the job. It has always astonished me that I could make a living from doing this and even more that so many folks would actually set out to spend their hard-earned money on doing such things and putting themselves in such awkward positions willingly. See the world? Why bother? It just isn’t all it’s cracked up to be, when a lot of what you see leaves you wishing you hadn’t. Yet I may have always been fated for this calling. Back in the fourth grade, or maybe the third, all the kiddies in my progressive Manhattan elementary school were charged with writing a first crude report on any country of their choosing. Most of my classmates, as I recall, took the easy route to places like Canada, Great Britain – who invented the “U.K.” anyway, when and what for? — or daringly, Costa Rica. I picked Chad. Where? Wha? Purposely, I headed toward the most obscure and desolate spot on the map, a veritable vacuum in the midst of civilization, some nearly unknown mid-African mess, a nowhere more than nation, entirely left off the posters on travel agency walls. I have no idea what I finally scribbled, probably in crayon, or what photos from those Google-less days I might have been able to paste down on pastel-colored construction paper. There was a big lake of the same name in Chad’s uncharted expanses, apparently, big wastes of sand and small numbers of life-wasting herders. Yet clearly I was already showing myself tragically drawn to the so-called “exotic,” future cause of much of my inspiration and all of my downfalls. If only I’d been satisifed with the New York corner candy store where the salted pretzel sticks still came out of a jar at two for a nickle. Since that fateful report back in 1959, I have never made it to “real” Chad on my own. I don’t think I ever proposed it, knowing it was so unlikely that Vogue or Conde Nast Traveler would really want to travel that far beyond their readership’s predictable resort-laden wanderlust confines. From my cousin, a journalist sent there once to cover some interminable civil war, I heard that V.I.P.’s in Chad’s capital (quick quiz: N’djamena, formerly Fort Lamy) were housed in the only supposedly five-star hotel, only to find that rows of gleaming new toilets were left in the hallways, so far unconnected for use. Had he been exaggerating? It made a good war story anyway, a great souvenir of the road less, or hardly ever, traveled. Perhaps even back then, barely out of knee pants and more interested in Mickey Mantle’s batting average than discount air fares, I may have sensed that whatever could be found “out there” had some deep and unspoken connection to explaining who I was “back here” – and that the travel writer is someone who deals in, and brings home, the kind of facts that I could never find in my grade-schooler’s Encyclopedia Brittanica. While my blog will concentrate on destinations and their essence, I will be using this as a personal “soap box” from time to time. And I am disgusted, like most of the civilized world, by today’s ruling of Hong Kong’s Supreme Court that so-called “domestic workers” (i.e. Filipino maids) can never become residents of the country (psuedo-country at best) where they spend the vast majority of their lives slaving away. Any fight by Hong Kong people for their human rights is undermined by their treatment of those who raise their children and cook their food — “Why don’t you love the ones who take care of you?” I remember one maid’s protest sign reading. Filipinas, and increasingly, even more easily exploited Indonesian women, are a colonized people, treated worse by the Chinese than the British ever treated them. I know firsthand about the sexual abuse, long hours, broken contracts, false terminations, loan sharking, years of separation from families, etc., etc. For two years, while I was a reporter for the Asian Wall St. Journal, I infiltrated the maids who took over Central in Hong Kong on their day-off every Sunday and documented with a Handycam their many ways to reclaim their humanity (from religious frenzy to beauty pageants). The 150 hours of video that I recorded are a unique documentation of the culture of poverty and migration and the amazing happiness (“domestics’ bliss”) bred of community. As a writer, I have not had the time or technical knowledge to edit this cinema verite material properly. I am still looking for an eager young filmmaker who might want to take this material and unearth the documentary gold. Anyone reading, please contact…. The world is one big transfer desk. Everyone is trying to make a connection, get somewhere else before this somewhere sinks in. Call this the terminal the ultimate globalized non-place, a destination as instantly expendable as a crumpled boarding pass. Five a.m. in the midst of the desert could be a scene of mysterious beauty, but no one here needs to know that or even give up their state of denial as to which dictatorial state they have set down in. If necessary for those craving old-timey touristic experiences, the world’s tallest building and other spoils of oil wealth can be glimpsed for a split second through the unpleasant haze of an unexpected dawn while entering or exiting jetways. Groggily, whole tribes and nationalities and package tours and sects in starched white turbans stumble through metal detectors, McDonald’s, duty-free hypermarts, cafes savagely overpriced in strange Arabic coinage. Filipino lady barkers, chirpy English-spewing clones employed everywhere, beckon toward sushi and caviar bars, and everyone else plays musical chairs with not enough uncomfortable lobby seats for everywhere to sink into stupor in. The whole world seems jet-lagged, knocked-out, trapped in a festival of discomfort. Lost souls and tour groups snore in unison. Most are Chinese peasants in undertaker suits clutching tickets to plow fields of consumerism. I glance up to notice the victim next to me picking up purse and belt from scanner conveyor belt appears to be Nicole Kidman, identifiable by her purposely mannish designer gear as several personal sycophants hover near least this Hollywood mirage succumbs also to the general ugliness that’s too weary and unoriginal to even be called ugly. Here, if such a word applies, the worst of everything has been conveniently gathered, the worst people, worst ingestibles, worst luxury colognes, worst adverts, worst trips for the worst motives. The prayer rooms look like mirrored Vegas casino adjuncts, the toilets can’t keep up, the smoothies are rough and the minimum wage workers of the world have nothing to lose but their plastic hygienic hand gloves required for falafel wrap wrapping, brick-like frozen croissant reheating. In this meta-monster, they’ve already run ahead of marketing jingles just trotted out and run out of gates. The busses to parked planes take half an hour or more but no one complains about anything that can get them out of Emirateland as rapidly as inhumanly possible.